Although I could never be go the Full Hippie, I do like to think of myself as New-Age-adjacent, and I enjoy seeing my spiritual and political beliefs reflected on-screen, even when it’s through the fun-house mirror of parody. So, in theory, I’m the ideal audience for a comedy like Wanderlust (2012), which follows a couple of burnt-out suits fleeing New York to join a rural commune in Georgia… but, in practice, I thought it sucked. The problem is that the cast aren’t playing their characters, so much as mocking them from within, with a snide imitation… as if the entire story were a feature-length anecdote they were telling to their bar-room buddies, and every line of dialogue was preceded by an unspoken “And then he was like,…” Obviously humour is subjective, and I’m sure there are a lot of people who can enjoy this movie on its own terms… but I find this particular style of writing and performance very off-putting… and it’s a shame, because I’ve enjoyed a lot of writer/director David Wain’s work in the past. If this movie had treated the subject with the absurdism of Wet Hot American Summer, or the sincerity of Role Models, then it could well have been one of my fave comedies of the year… rather than going straight from my DVD player to the “donate” pile. To be fair, there were a couple of lines/beats that made me laugh out loud (most of them involving Alan Alda, as the commune’s slightly frazzled co-founder), and I thought the tripping sequences were great (especially when Paul Rudd turned into ‘The Corinthian’! )… but overall, it was just too mean-spirited and glib to inspire any sustained amusement or affection. Cast-wise, I know Jennifer Aniston still has a high-profile and a huge fan-base thanks to her work on Friends, but for me she’s long since passed her saturation point… and I was particularly aggrieved to see her get a starring role here, while the incandescent Lauren Ambrose was lumbered with a blurry, back-seat supporting role. “She’s pregnant, and keeps pointing out that her boyfriend is black! HILARIOUS!! !” Meh. 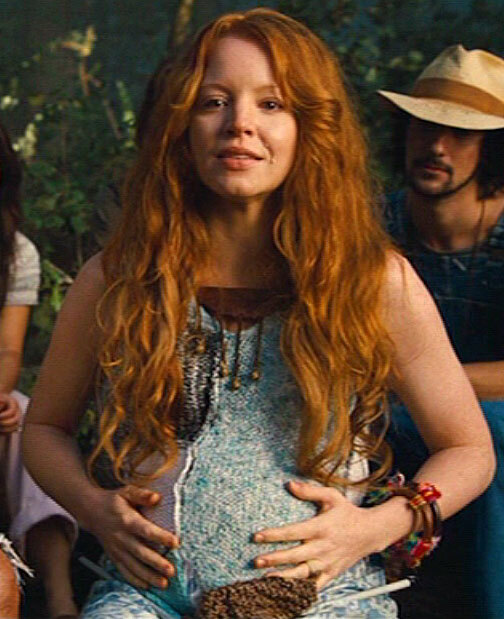 I did enjoy the way her soft-focus romantic moment with Rudd segued into a birthing scene, and her strained reassurances about how beautiful and natural the moment was confirmed what a gifted comic actress she is… it’s just a shame she didn’t get more opportunities to work her magic here. This entry was posted in Rants about Films and tagged Jennifer Aniston, Lauren Ambrose, Wanderlust. Bookmark the permalink.